Spend the 3rd (Sun) exploring nature at Sydney Harbour National Park. 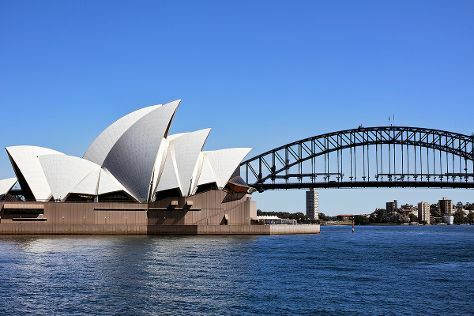 And it doesn't end there: catch a live performance at Sydney Opera House, hike along Bondi to Coogee Beach Coastal Walk, enjoy the sand and surf at Bondi Beach, and don't miss a visit to Sydney Harbour Bridge. To see traveler tips, where to stay, other places to visit, and other tourist information, read Sydney trip itinerary app . If you are flying in from Australia, the closest major airport is Sydney Kingsford Smith International Airport. In January, daytime highs in Sydney are 32°C, while nighttime lows are 23°C. Cap off your sightseeing on the 6th (Wed) early enough to travel to Karon. Karon is known for beaches, shopping, spas, adventure, and classes. Your plan includes some of its best attractions: enjoy the sand and surf at Patong Beach, take some stellar pictures from Nai Harn Beach, buy something for everyone on your list at Jungceylon, and stroll through Freedom Beach. For where to stay, maps, traveler tips, and tourist information, read our Karon trip planner. Do a combination of flight, bus, and taxi from Sydney to Karon in 12.5 hours. Traveling from Sydney to Karon, you'll gain 3 hours due to the time zone difference. Traveling from Sydney in February, you will find days in Karon are somewhat warmer (38°C), and nights are about the same (26°C). Cap off your sightseeing on the 10th (Sun) early enough to travel to Nai Yang. Kick off your visit on the 11th (Mon): tour the pleasant surroundings at Nai Yang Beach, enjoy the sand and surf at Nai Thon Beach, then look for gifts at Jasmin Fashion, and finally identify plant and animal life at Green Elephant Sanctuary Park. To see photos, more things to do, other places to visit, and tourist information, you can read our Nai Yang trip planner . You can drive from Karon to Nai Yang in 1.5 hours. February in Nai Yang sees daily highs of 38°C and lows of 26°C at night. Cap off your sightseeing on the 11th (Mon) early enough to travel to Goa. Goa is known for beaches, historic sites, shopping, nightlife, and spas. Your plan includes some of its best attractions: kick back and relax at Agonda Beach, tour the pleasant surroundings at Galgibaga Beach, wander the streets of Old Goa, and admire the striking features of Se Cathedral. To find where to stay, photos, more things to do, and tourist information, read Goa visit planner . Explore your travel options from Nai Yang to Goa with the Route module. The time zone changes from Indochina Time (ICT) to India Standard Time (IST), which is usually a -1 hour difference. Expect little chillier weather when traveling from Nai Yang in February: highs in Goa hover around 30°C, while lows dip to 28°C. Wrap up your sightseeing on the 18th (Mon) early enough to travel to Kochi (Cochin). Change things up with these side-trips from Kochi (Cochin): Kumaranalloor (in Kottayam) and Mararikulam (Marari Beach & Mararikulam Beach). Pack the 23rd (Sat) with family-friendly diversions at Wonderla Amusement Park. Pamper yourself for a day on the 26th (Tue) at some of the top local wellness centers. There's lots more to do: don't miss a visit to Chinese Fishing Nets, get your game on at Plug And Play Gaming Lounge, stroll through Fort Kochi Beach, and take in the spiritual surroundings of Church of Saint Francis. To find out how to plan a trip to Kochi (Cochin), use our trip itinerary maker. Traveling by combination of taxi and flight from Goa to Kochi (Cochin) takes 4.5 hours. Alternatively, you can do a combination of taxi, flight, and bus; or drive. Expect a bit warmer weather when traveling from Goa in February: highs in Kochi (Cochin) hover around 38°C, while lows dip to 28°C. Wrap up your sightseeing on the 27th (Wed) early enough to travel back home.